During this trip, each Sunday, we just look up a Catholic church close to where we happen to be that has ample parking and mass at a time we can get to. Today the church that fit all those requirements was San Xavier del Bac Mission. We didn’t do much reading about the church prior to driving here; we just came for mass. We got mass and a history lesson, too—plus gorgeous scenery all around. At the risk of being criticized, I’ll confess that I’ve never been a fan of hugely ornate churches, and that I’m not a big fan of statuary, other than to admire it as art. Personally, I prefer the simple churches, where we concentrate on prayer rather than on lavish shows of material things. 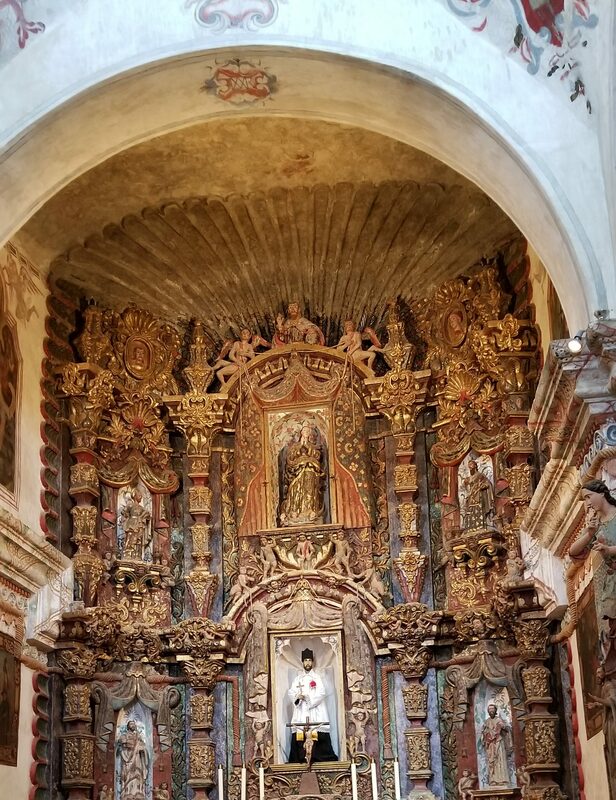 But there’s something to be said for the number of hours it took to construct a church like this and to create the art within its walls with the limited resources they had in the late 1700s. We also should not forget that not all missions were welcome, and that most of them operated on stolen land. 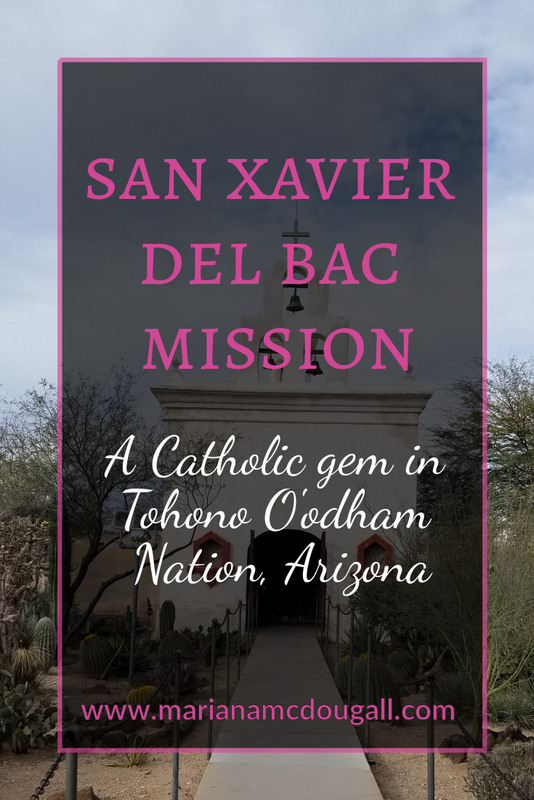 The history told at this particular mission seems to portray it as well received, and San Xavier del Bac sits within the Tohono O’odham Reservation near Tucson, Arizona, where some indigenous customs seem to have been preserved alongside the adoption of Catholicism. The village is well taken care of, and the people are friendly. The church is active, and in addition to parishioners, many pilgrims visit it each year. Many claim they have received miracles here. After mass, we visit the museum, which tells the story of how the church was built, and the efforts made to preserve this historical building. There is no charge to walk through the museum, but donations are welcome in a box at the entrance. Near the church, there is a hill and a grotto, and I brave climbing the hill after mass. With my knee braces on and my walking stick to help me, I make somewhat easy work of climbing without a path to guide me. Many people come up here to place candles and pray for miracles. Unfortunately, the wind knocks down the candles, so the rocks are littered with glass. If you do come and decide to climb, watch where you place your feet and your hands. I’ve found this place peaceful and enjoyed walking through here, so we return again on a different day, after spending time at Saguaro National Park. When we return to the mission, I go into the church to pray the rosary. First I walk through the church and take in the details. It’s a little easier to notice more this time, because Dan has the kids back at the RV. After walking through, I sit in one of the pews, with my walking stick beside me. My knees are really sore today and have given out a number of times, even though I have my braces on. I need my walking stick for support. But now that I’m sitting down, I’m fine, and I start to pray. After a while, a dog meanders into the building. There are many dogs on the reservation, and they walk about freely, looking like strays, but they have collars on. This dog comes into my pew and places his head on my lap. He’s obviously waiting for me to pet him, so I do. When I stop, he places his head on my lap again, and I pet him again. He leaves a while later. When I’m done in the church, I ask someone outside who the dog belongs to. He says he belongs to the village, and everyone looks after him. I’m not sure, but it seems that strays might walk into the mission, and the people who live here just adopt them. We also meet a friendly cat later. The church is impressive, the museum is interesting, and there are lovely items in the gift shop. But the most impressive part of this place, to me, is the natural beauty surrounding the human-made buildings. After enjoying our visit, we try some Indian Frybread, which was quite delicious. I tried a savoury one with beans and cheese, and a sweet one with cinnamon sugar. They were both delicious, and I think I’d like to try making some when I return home. They’re definitely a treat food to be enjoyed sparingly, but they sure are good. 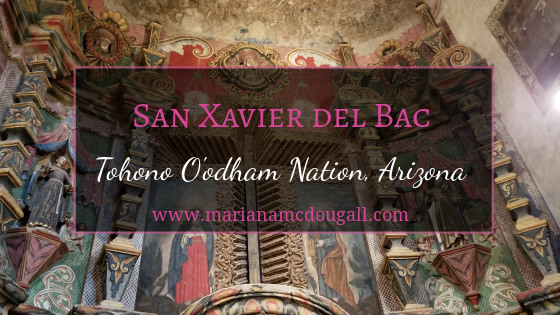 We had two very pleasant visits to San Xavier del Bac, and we highly recommend making the trip here, whether you’re a history buff, Catholic pilgrim, a lover of mountains, or just someone who enjoys learning more about the places you visit.